The primary "extras" our store offers in support of credit card and debit card users are several versions of a manual transaction register. Like a standard manual check register (which we offer as well), our money card registers are registers that you maintain by hand. 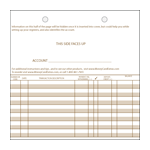 Yes, just like your standard check register is used to track your rent, utility, and car payments by check, these special manual registers are designed for keeping track of your money card transactions, registers which, surprisingly, have not been widely available -- until now!